I'm so excited to finally share all of the details from my baby shower with y'all! My entire family came in town all the way from Kentucky and the shower was absolutely magical. It was so much fun and all of the planning that went into it totally paid off. Keep reading to see all of the photos and hear more about it! I set the date for my shower almost 6 months ahead since my family was flying from Kentucky. My sister is also a nurse and has to ask off way in advance. After that, I searched and searched baby shower ideas on Pinterest but couldn't find a theme that I really liked. Luckily, one day it just hit me that I wanted to have a french market themed shower after seeing a super cute invitation with a french bulldog on it! 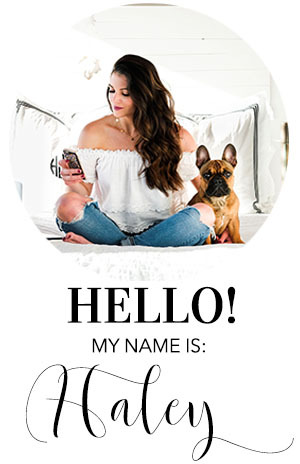 If you follow me on Instagram, you know how obsessed we are with our frenchie Dwayne, so having him on the invitation seemed like the obvious choice. A lot of our home decor is french inspired too and since the shower was at our house, the theme worked perfectly! My family helped me plan everything but I'm a control freak when it comes to planning events, so I did a lot of things myself. I went to design school and I just can't help it ok?! I made all of the chalkboard signs which turned out SO CUTE (see the tutorial here), did the calligraphy on the invites, and obsessed over planning all of the little details. All of our hard work paid off because despite the random SoCal rain, it looked and felt just like an indoor French market! The food was absolutely perfect AND almost gone at the end of the shower- whoohoo! We had the croissant sandwiches catered from Whole Foods, cut down these deli wrappers to size, and tied them with baker's twine to make them look extra cute! My friend Kelly put together the most gorgeous cheese board I've ever laid eyes on(!) and we added some veggie cups to the mix for more food options. For desserts, we had a cake catered from Susie Cakes, chocolate croissants from Whole Foods, macarons from Trader Joe's, and Madeline's from Costco. The best part about the food was that no one had to make or bake a thing! Since the theme was French market, a little flower market was a must! I found a wonderful florist after asking around at work and she got the most gorgeous hydrangeas from the market I've ever seen! We put all of the gorgeous blooms in galvanized buckets so that guests could make their own arrangement to take home and it was a major hit! Instead of a game, I had guests fill out a "Wishes For Baby" card. After the shower, I put them all in a scrapbook with polaroids that I took of the shower so he can look through it one day. I haven't done the best job with documenting my pregnancy with weekly photos, but at least he will have this little book filled with thoughtful words from all of his loved ones! The dress I wore for the shower was absolutely dreamy and made me feel so beautiful. It isn't maternity, so I just sized up to a Large and luckily it fit my bump perfectly! The length ended up being perfect with flats too- lucky me! It's definitely a splurge item but would look stunning in maternity photos as well! That pretty much covers all of the planning and details of the shower, but if you have any questions feel free to leave a comment below! Thank y'all so much for stopping by and letting me relive the best baby shower ever!